※ Folds compactly: The massage chair with compact and foldable flat design along with a sturdy nylon carry case makes it space-saving and easy for storage. Chair itself only weighs 23lbs. 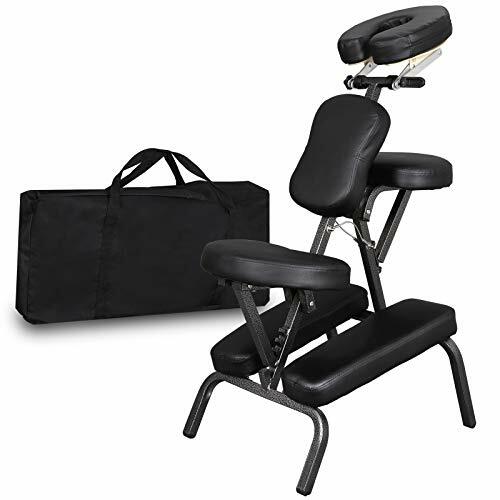 ※ Super Versatile: Ergonomic adjustable armrest, seat, chest pad and head support, simple facecradle armrest and seat adjustments to accommodate all client sizes, ensures a comfortable and body relaxation for your clients. ※ Sturdy Frame: Constructed of aircraft grade aluminum, lightweight and tremendously strong, high gloss powder-coated finish, which greatly extends the chair service life. Working weight up to 660lbs. ※ Overall Dimensions: 23"(L) x 18"(W) x 42"(H); The simple and modern style of the chair perfectly matches different settings of the shops or houses, ideal for home, gym and office use.